There is a good chance these might be the last pictures of the little House Wrens for this season. As you can see they are sticking out their neck very far to be the first one who gets the food and we expect them to leave the nest as early as tomorrow morning. The adult female was calling them already today. The photos reveal that there are at least two juveniles in the nest but it would be no surprise to have even 3 or 4 young birds. After they leave the nest they might be still around for a few days and will be still fed by the mother. Their departure sounds the bell for the last part of summer. We don’t know why the male House Wren hasn’t been present during the nesting time. Usually we have seen males guarding the nest and supplying food. He may have been the victim of a predator. 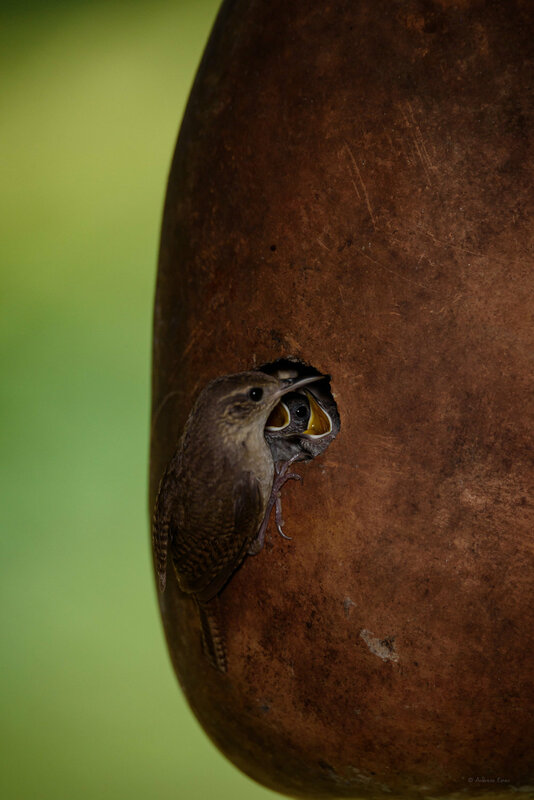 If I have a chance to see the bay wrens leave the gourd that contains the nest, I will stop in my tracks and try to make a click.